Mother Earth News attended the Heritage Chicken Definition kick-off event in Lindsborg, KS, on April 17, 2009. They were kind enough to record several videos helping to provide clarification on the new definition. Below are a few of the videos, courtesy of Mother Earth News. If you have questions about the Heritage Chicken definition, please feel free to contact ALBC. How are Heritage Chickens "certified" as Heritage? On April 17, 2009, the American Livestock Breeds Conservancy officially unveiled its definition for Heritage Chicken. ALBC held a press event and Heritage Chicken meal in Lindsborg, KS, with the help of Good Shepherd Ranch. 1. APA Standard Breed. 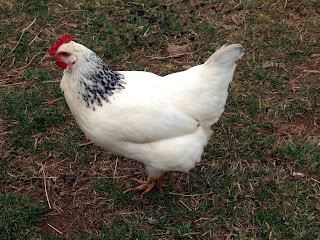 Heritage Chicken must be from parent and grandparent stock of breeds recognized by the American Poultry Association (APA) prior to the mid-20th century; whose genetic line can be traced back multiple generations; and with traits that meet the APA Standard of Perfection guidelines for the breed. Heritage Chicken must be produced and sired by an APA Standard breed. Heritage eggs must be laid by an APA Standard breed. 2. Naturally mating. Heritage Chicken must be reproduced and genetically maintained through natural mating. Chickens marketed as Heritage must be the result of naturally mating pairs of both grandparent and parent stock. 3. Long, productive outdoor lifespan. Heritage Chicken must have the genetic ability to live a long, vigorous life and thrive in the rigors of pasture-based, outdoor production systems. Breeding hens should be productive for 5-7 years and roosters for 3-5 years. 4. Slow growth rate. Heritage Chicken must have a moderate to slow rate of growth, reaching appropriate market weight for the breed in no less than 16 weeks. This gives the chicken time to develop strong skeletal structure and healthy organs prior to building muscle mass. Chickens marketed as Heritage must include the variety and breed name on the label. Terms like “heirloom,” “antique,” “old-fashioned,” and “old timey” imply Heritage and are understood to be synonymous with the definition provided here. Abbreviated Definition: A Heritage Egg can only be produced by an American Poultry Association Standard breed. A Heritage Chicken is hatched from a heritage egg sired by an American Poultry Association Standard breed established prior to the mid-20th century, is slow growing, naturally mated with a long productive outdoor life. Anne Fanatico, PhD, Research Associate, Center of Excellence for Poultry Science, University of Arkansas;Kenneth E. Anderson, Professor, Poultry Extension Specialist, North Carolina State University.